The Godrite of evolutionary based Origins is impossible to find intact around the world, yet taught as fact for over 100 years proved wrong. Order The Noah Code to learn Much More! The Bible teaches that the earth was made "out of water and with water" (Genesis 1, & 2 and 1Peter 3:5) then was subsequently destroyed by water in the Great Flood, noting that 75% of the earth's surface is made of sedimentary rocks, deposited through and by water. Also note over 90% of these were laid down by water action in Continental and larger in scale. Most of these layers contain fossils and artifacts of every sort. Interestingly enough, deep down in these layers geologists have found remnant sections of an earlier earth, these sediment layers called "Pre-Cambrian" or pre-life. They define them "pre-life" because they contain no fossils, except pollen,* the same pollen we find in modern rocks! As there was no mass death recorded before the flood event, we should expect to find a virgin layer without fossils at such depths, the earth of the primal creation week. In truth, the evolutionists are again mistaken, as life existed and was more prolific back then! So these sediments would be the ground Adam walked upon in the First Earth. Why are they fossil free? That’s simple, when you look at their structure you see above them thousands of feet of uniform water driven layers, full of fossils or dead things, exactly what we would expect if there was a world-wide flood. It''s prime directive? ; the destruction of all air-breathing life! 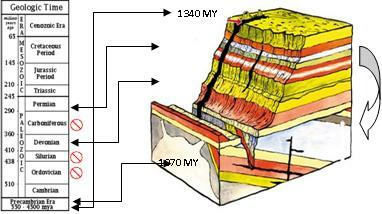 These layers the geologist refers to as the Cambrian or Life layers, but actually they have it backwards again! These upper are the death layers, where life ended in mass destruction, including those of the dinosaurs and large mammals, like the Mammoths! Flip it upside down to fit Montana and Alberta, reshuffle to fit Alaska, Switzerland, Oregon and Wyoming. This graph assumes that slow processes cover and preserve fossils over eons of time, supposing that evolution is proved by the vertical succession of complexity found in the strata. It also assumes the impossible, that if a creature dies, it’s slowly covered by sediments and fossilized, something that rarely or only in extreme cases ever occurs in nature. In so doing, their supposed sequence of increasing size and complexity of life somehow "proves" life evolved from simple to complex forms. We know from experience this is not how it works in nature. If an animal dies, its normally quickly dismembered, consumed or dismembered by any number of means before being covered in sediments over great ages. We also know from experience there are no intermediate forms running around today. Further, as mentioned in chapter one, cell operation precludes any possibility of such changes, as the mechanism is utterly dependent upon change in the genetic code, a code that’s closed and originates from a Super-Intelligence! That there is a specific genetic program for each individual creature, even a different code for a male and female! Proof positive that intelligence is behind the whole matter. Geologically and in actual practice, the entire chart exists nowhere on earth; and few secular geologists are brave enough to admit it, such talk invoking the consequence of shunning or loss of employment. 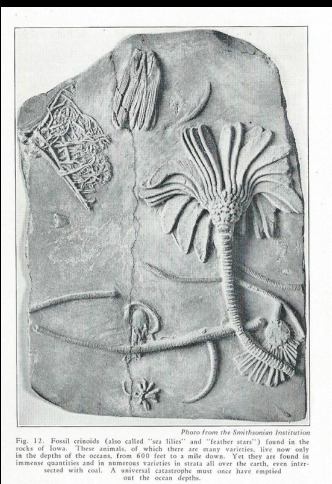 Below - Crinoids, found in Ohio but grow deeper than 600 feet in today’s seas, also identified atop Mt Everest! Last at the top, we have humans, land and marine mammals. From a flood perspective, portions of the chart tell a story, a flood story, misinterpreted as accumulating long ages, when actually 90% of the layers represented were formed in one year, not a billion. The column of stratigraphy has usefulness in following a specific layer across voids of terrain for identification purposes, but it's entirely useless as any proof of evolution. 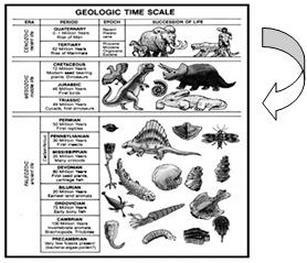 So we find in this drawing, the Geologic Column, proposed as truth for generations not only in error, but a complete misrepresentation of the real evidence from the field. Animals that bloat and float (like the mammals) would often be found entombed higher in the layers; they being dismembered and buried last, depending upon the rapidity of the covering. Of course, as the flood was not a calm and uniform event, we would expect to find exceptions, such as that in Alaska where we have dinosaurs buried above mammals at Colville River on the North Slope, with a coal layer between! One must also assume the better runners and swimmers would find high ground before being overcome, people inclusive, they knowledgeable of the ultimate demise. Such would account for human fossil deposits being found higher as they moved to safe ground, explaining why few are found in proportion to the heavier reptiles buried early on. We can assume floating biomasses existed for square miles in various places, this an intermingled body of dead corpses and vegetable masses, some sinking and covered by sediments, and some creating the coal and oil deposits we see today. Among the coal formations we find many fossils: e.g. a shark was unearthed as recently as 2010 in coal, a date of over 200 million years immediately assigned to the remains with no C-14 testing at all! The geologist simply moved his finger down the chart to the "carboniferous" and pronounced the age of the coal. These floating masses would have attracted carrion eaters of all types including the large sharks, evidenced by the type of bone fracturing exhibited in many deposits and shark teeth remains, especially among the ossifurous deposits previously mentioned. With the detonation of the volcanoes we could expect tremendous underwater die offs from concussion impact, effecting the fishes and marine mammals around the world. In support of this we do find large mixed die-offs imbedded in the earth. Here animals such as whales and marine mammals are piled en masse,[i][ii] some at high altitudes. Also found are mass deposits of fish, many with arched backs and other marks of stress, suggestive of concussion death where complete schools were annihilated leaving deposits measured in many square miles. Geologists Comment on the "Chart"
Finally, we leave the infamous chart described by those more experienced and wiser, no longer inclined to allow paper to cover what the rocks truly tell us. Geikie tells us his volume writing in his chapter called the "Order of Superposition — the Foundation of Geological Chronology"; "As sedimentary strata were laid down upon one another in a more or less nearly horizontal position, the underlying beds must be older than those which cover them. This simple and obvious truth is termed the Law of Superposition. It furnishes the means of determining the chronology of rocks; and though other methods of ascertaining this point are employed, they must all be based originally upon the observed order of superposition. The only case where the apparent superposition may be deceptive is where the strata have been inverted, as in the Alps, where the rocks composing huge mountain masses have been so completely overturned that the highest beds appear as if regularly covered by others, which ought properly to underlie them." [v] He continues: "Mere difference of lithological character, even within a limited geographical space, does not necessarily mean diversity of age." [Emphasis added] Geikie also discuses the common formation of inter-bedding, where wedges of various strata inter-tongue perfectly, allowing for no space in time ,and explains the development of such features occurring in the present along beach formations found in the UK, but on a smaller scale. He goes on to explain the phenomena known now as "Polystrate Trees" where individual tree trucks span multiple geologic time intervals, again confounding the notion of uniform long age bedding of such members, invalidating the Geologic Column. “Does our time scale, then, partake of natural law? No, I wonder how many of us realize that the time scale was frozen in essentially its present form by 1840? How much world geology was known in 1840? A bit of Western Europe, none too well, and a lesser fringe of eastern North America. All of Asia, Africa, South America, and most of North America were virtually unknown. How dared the pioneers assume that their scale would fit the rocks in these vast areas, by far most of the world? Only in dogmatic assumption – a mere extension of the kind of reasoning developed by Werner from the facts in his little district of Saxony. And in many parts of the world, notably India and South America, it does not fit. But even there it is applied! The followers of the founding fathers went forth across the earth and in Procrustean fashion made it fit the sections they found, even in places where the actual evidence literally proclaimed denial. So flexible and accommodating are the “facts” of geology. [vi]"
[vi] Edmund M. Spieker: “Mountain-Building Chronology and Nature of Geologic Time-Scale,” Bulletin American Association of Petroleum Geologists, Vol. 40, August 1956, p. 1803. [vii] Whitcomb, J and Morris, H. (1961). The Genesis Flood (pp. 209-211). Phillipsburg: Presbyterian and Reformed Publishing Company. Chief Mountain of the 360 mile Lewis Range. The older strata sit atop the younger with a missing gap of 400 Million years! “There is no man on earth who knows enough about the rocks or the fossils to be able to prove in any fashion fit to be called scientific that any particular kind of fossil is actually and intrinsically older or younger than any other kind. In other words, there is no one who can actually prove that the Cambrian trilobite is older than the Cretaceous dinosaur or the Tertiary mammal. "[iv] "The fact is, the current geology is wholly built up, from the Cambrian to the Pleistocene, on the dogmatic denial that any such catastrophe has occurred to the world in which man lived; for one such event happening in our modern interdependent world is enough to make the whole pretty scheme found in our textbooks tumble like a house of cards. "[v] Yes, this is the great worry of the evolutionist, as documented in the quoted NAS pamphlet! But as we shall soon show, his worries have only just begun, now comes not a worry for evolutionary geology, but their worst nightmare: The Great Unconformity. Mentioned briefly in this volume, there is a well known place where one can read the flood story written in stone, and its right here in America in the Grand Canyon. Within its depths we find the evidence fully supporting the Biblical narrative directly in the rocks, where they may be felt, touched and seen. Amazingly, the water that eroded the Grand Canyon cut through to these upper layers to the First Earth sediments. In the image above notice the tilted layers beneath the red line, directly slicing through a spot where the first-earth layers lay. Further, we find these primal layers tilted and fractured, sitting at angles. This indicates the entire crust was smashed at this locale. I suggest this occurrence was not accidental; but God himself picked this very location, forever proving to man the Bible account reliable in a volume written on a billion tons of rock. Though rarely documented in school textbooks, we have at the bottom layers of the canyon the original earth eroded off flat, as if by a giant rock saw. What layer sits directly above this cut? Hundreds of feet of near pure sandstone, which geologists named the 'Tapeats', and not only sandstone, but a sandstone full of marine fossils! Note this layer is intercontinental in size, extending over a million square miles! Plainly, this line of evidence points nowhere else, what student of flood geology could construct a better model if he had ordered the billion tons of rock in place himself, all demonstrating that the flood was true! In the Grand Canyon, note that the Ordovician, Silurian and Carboniferous units representing 270 Million years are missing. Isotope dating of magmatic flows show the upper flow dates older than the canyon bottom flow by over 200 MY! The Mt St Helens valley (right hand image) was cut out in a single day. The Grand Canyon (left hand) was cut out as the waters ran "continually off the earth for 150 days" in the Flood. On the left, notice the exposed rough walls cutting through the granites, indicative of a past catastrophic event, not from slow erosion processes of the Colorado River as geology texts claim. Can a river eroding one-grain-of-sand at a time leave the jagged edges (dark rock center left and right)? No, rivers leave smooth walls. The Mt St. Helens eruption and the Missoula Flood taught geologists a catastrophic gush of flood water can rip through mountains! The Tapeats is classified as a turbidity - a high speed underwater mud flow. As can be determined from the wide distribution of this formation, a "local Flood" was not involved in this massive deposit. "You are Here" The Tapeats sandstone contact zone at canyon bottom indicate tremendous forces and heat enough to melt granite. The Great Unconformity - close up and personal. Here you can see the heat tempering caused by the friction, weight and the sawing action of millions of tons of water laden sediments from the flood. They acted cutting off the tops of these granite blocks, (actually mountain ranges) by the Tapeats sands near the bottom of the Grand Canyon. The Park Service signs tell public the Canyon was formed by 10 or more "calm and placid seas” over many millions of years, a concept not at all supported in the rocks. The Great Unconformity contact zone exhibits' heat, severe compression and a perfectly defined event horizon, only ½” thick in places. The Unconformity and these water deposited layers tell a history story in the rocks, a serious story that is anything but "calm and placid. [i]" These images speak for themselves. Many professional geologists agree with the conclusions mentioned here, there is no refuting this evidence. Now we shall consider another formation unexplainable by uniformity or local processes, the Tyee formation in Oregon. The Tyee Deposits of Oregon. The Tyee deposit, (top arrow) extends across a thousand square miles of the Oregon Coast range, here at 4,000 ft! A section of water deposited hi-speed mudflow with fossils makes up the (RH) peak of the Mary's summit at the 4,000 foot level. How did it get up there? Deep sea drilling revealed its thickness is in excess of 10,000 feet at sea! Mary’s Peak is located near Corvallis, Oregon. The hump just to the right of the summit in the upper image is actually a sandstone turbidity deposit (a high-speed underwater mudflow). This layer is part of the Western Oregon Tyee formation found here at the 4,000 feet level. What is a water pushed flow containing fossils doing up it this altitude? Notice in the drawing the fault line (center vertical) indicates more of the Tyee was higher on the formation but was somehow eroded. This means our entire Peak here was under moving water for a period. The Coast Range in Oregon is a result of the Pacific Plate being rapidly pushed under the North American Continental Plate, which bulged this area vertically. The Tyee shows up atop many of the mountains near and south of Mary’s, substantially thicker in places and tilting to the south. A recent study using spectral analysis of the granules that makeup the Tyee pinpointed a new origin of the material - the Rocky Mountains! [i] This finding has thrown off the cosmology of much of the Northwest, giving strong support to the Flood model of origins. It would appear the Continental Divide uplift caused a westward current off-flow, eroding the Rockies. Their particles became the Tyee, flowing to the west to the ocean, not from the south, as postulated for 100 years. A 1964 USGS study completed by Dr. Parke D. Snavely, Jr., Holly C. Wagner, and Norman S. MacLeod[ii] documents the Geology of the Tyee, showing the area was reformed by a tremendous catastrophe involving volcanism, pyroclastic flows, ash and water in the not too distant past. The study elaborates for pages describing how this part of the west was catastrophically destroyed volcanically and redistributed by water, leaving deposits like the Tyee behind, building to a thickness of up to 10-15,000 feet! A “pyroclastic flow” of ash debris infused with superheated water, mentioned in this report. Such massive geologic work would have affected the entire world, doing more geologic work than Kakatoa itself! Events similar (yet thankfully smaller) were witnessed firsthand at Mt St. Helens in May of 1980, requiring the rewriting the feature forming theories in the geology textbooks. At St Helens, it was found by observation that textbook descriptions and theories of topographical origin had been in error for over 150 years. Such explanations were falsely based on "one-grain-of-sand-at-a-time" concepts, held in suspicion by flood geologists for years, while University class after class of trusting students were deceived for decades! What actually forms many valley features (as determined from the St. Helens and Missoula Flood events) is that these high speed clastic flows of volcanic debris simply dredge out valley channels as they move (some found moving up to 60 MPH). In other words, the drainage formed is a result of fast formed channels, not from water erosion for eons of time! Helicopter crews patrolling the St. Helens post-eruption area witnessed this process, observing cars fleeing before these advancing flows, landing and extracting the terrorized passengers just in the nick of time! The flows are made up of a rolling mass of scalding ash/mud and debris, carrying trees, parts of homes and vehicles along, sweeping away everything before their might! No geology textbook on earth is found to describe this process, yet the valley structures they leave were taught as formed over millions of years for decades. Professor Ewart Baldwin, University of Oregon's Geology department Director for many years, stated that the Tyee was formed quickly and eroded rapidly! The Tyee carried the land borne sediment to the sea as the "waters ran continually off the earth," thus leaving our little but troubling piece of sandstone turbidity atop Mary's Peak at 4,000 feet! The Grand Canyon (RH) layers reach 7,000 feet above the canyon floor. On the left, the Tyee, a single homogenous deposit of 6,000-15,000 feet, deposited and eroded "rapidly" per the late Dr. Ewart Baldwin - Geology of Oregon 1976 &. Dr. Parke Snavely, etal 1964. Dr. Baldwin[i] mentions the Tyee formation's great thickness and states: [it] "must have been deposited catastrophically." He stating this massive water deposited formation as uncomfortable and catastrophically deposited, then he asserts [it] “quickly eroded,” confounding the Geologic Chart and in agreement with the latest science on the formation! So we have the Tyee, another monument to catastrophe on Mary's Peak, the Last Mountain Standing. The Lewis Range has trilobites and other "older" fossils within the top layers, and far younger fossils according to the "geologic chart" in the base. The best explanation: silence, the next, makeup a good pushing story, a billion tons worth. Turning to more oppositions of the Geologic Chart relative to the actual stones, we showcase the concept of Overthrusts, the notion that large geologic formations, including mountain ranges, somehow pushed over younger structures, this in variance to the shrine of the Geologic Column. The classic example of this interpretation is found in Montana and British Columbia in the Lewis Range, where uniformitarian geologists maintain billions of tons of rocks containing older fossils of the Cambrian may sit uncomfortably atop younger rocks, yet no one among institutional geology dare question it. [ii] Price, quoting Willis, Research in Asia, Vol. 2, p. 24. Figure 86 The horizontal lines intersecting the adjacent terrain cross-valley. The material was deposited level at the onset of the Flood, the missing material eroded as the Flood waters rushed off the earth’s surface. 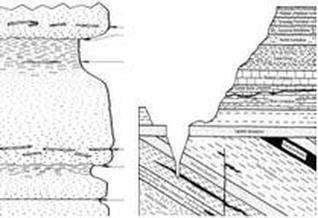 Such hill structures are the most common in the world. "The origin of far-transported, resistant, well-rounded quartzite rocks in the northwest United States and adjacent Canada has been documented. [i] These gravel-to boulder-sized rocks have been transported up to 1,200 km east of the Rocky Mountains and 650 km west, and have filled deep paleovalleys with over 4,500 [meters] of thick conglomerate in eastern Idaho and northwest Wyoming. The Bighorn Basin is about 190 km north-south and 110 km east-west, an area of 20,900 km2, not an insignificant area… a widespread erosional event must have removed at least 744 m of the basin fill in the eastern half of the basin…it must have been transported a great distance, perhaps all the way off the continent. [ii] [PH1] In another example of sediment transportation in the Bighorn Basin, Oard mentions: "Some of the gravel is quartzite, but the closest source of quartzite is central Idaho [PH2] about 400 km away. What post-Flood mechanism could have accomplished all of this geological work? [iii]"
Only water action of the magnitude of the Flood could explain the transportation and filling of such a massive trough. The geology around the perimeter of this area shows no signs of the ability to seasonally transport sediments to this extent. The size and volume of this basin staggers the imagination as reflected in Artyushkov's assessment. Oard comments; "Although the coarse gravel in south-central Asia was not transported as far [as in the United States], it accumulated in thicker sheets; often reaching 1,000 [meters] with a maximum of around 3,000 [meters]! All of the erosion of the mountains and the accumulation of thick gravel occurred in the Late Cenozoic." Oard continues: "Similar gravel deposits have been found in south-central Asia. [vii] The transport of resistant rocks from the erosion of the surrounding mountains in that locale is somewhat different from that in the northwest United States and Canada, in that the gravel mainly forms an apron around the edges of the surrounding basins. Although the coarse gravel in south-central Asia was not transported as far, it accumulated in thicker sheets; often reaching 1,000 m with a maximum of around 3,000 m!" Concerning Africa, and large-scale planation surfaces, [level plains] especially those existing at altitude, are difficult to explain by any other mechanism than the withdrawal of the Flood’s waters in its late stage. Oard states: "These occur all over the world, although one of the most remarkable is that found in Africa. [viii] The African Surface, as it is called, covers most of Africa. Mountains, rift flank uplifts, and volcanoes were all once eroded down to form this planation surface up until the Mid Cenozoic. [Emphasis added] Then it was tectonically deformed, causing the erosion that created the Great Escarpment that circles southern Africa—also within the Late Cenozoic. The Great Escarpment is up to 9,800 feet or 3,000 m high in southeast Africa and is called the Drakensberg. It is difficult to imagine a post-Flood hypothesis (in other words, the geologic work involved would be hard to image happening today) that would explain such widespread erosion, both in creating the original large planation surface and the subsequent Great Escarpments. The strong implication is that the Flood created these features and the Flood/post-Flood boundary in much of Africa is in the very late Cenozoic. [ix]"
Oard[x] reports that Ollier and Pain maintain that after the base strata were folded by tectonic events, they were planed down to form flat surfaces, called planation surfaces, on all the continents, including Antarctica (cited text p. 214). This process cut across most previously folded sedimentary rocks, and smoothed both the hard and soft rocks evenly. "Even massive granites were "planed" over in many areas, as in the Tien Shan Mountains of central Asia (p. 144). The original surfaces were planed down to what is called base level, which the authors show is usually considered sea level (p. 3). Its interesting that one area occupied by the Apennines Mountains of Italy today, was planed below sea level!" “The remarkable thing is that plains of great perfection are even made, despite all the obvious possibilities of complications. But they are real, and planation surfaces were widespread before the uplift of the many mountains of Plio-Pleistocene [recent] age” (p. 302)." Erosional processes known today do not produce the immense landscapes the authors report. Only an event global in the scale of a Global Flood could do such geologic work. Oard comments: "The authors expressed surprise because the observed surfaces are inconsistent with their uniformitarian worldview. Present processes roughen surfaces, forming rills, coulees and valleys. Planed surfaces do not develop today, except on a very local scale when perhaps a river suddenly shifts its course and moves across tilted sedimentary rock. Furthermore, the field relationships show that planation in the past mostly occurred in the Late Miocene-Early Pliocene period (p. 302), suggesting that it occurred rapidly the authors stating: "At present, the cause of the observed high rate of planation remains a mystery.” Of course, Oard observes, "they ignore the effects of the Flood described in Genesis." "The Kimberly Plateau of north central Australia that was planed in the Proterozoic (ancient rock) and has apparently not been covered by protecting sediments since then (p. 27). It defies imagination how such a surface could have remained so flat for 600 million years or more, when present processes could dissect a continent and erode it to near sea level in 10 to 33 million years. The presence of such ‘old’ planation surfaces is objective evidence that the dating methods, both fossil and radiometric, used to date the time of planation are wrong. Oard notes. [xi]"
Oard continues: "Ollier and Pain believe this time frame is the origin of nearly all mountains and have an impressive amount of evidence to back up their conclusion. He says "In the mountains today we observe all stages of this past dissection. Some planation surfaces were dissected completely during uplift, leaving behind rough mountains with no sign of a planation surface. In other mountains, the planation surface is left on the top as an erosional remnant. Sometimes these planation surfaces are at different altitudes in the mountains due to differential uplift. 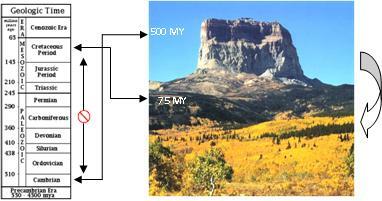 The highest mountains in Montana, the Beartooth Mountains, are an excellent example of this. They display impressive flat topped granitic peaks at a height of about 4,000 m."
Oard mentions the shocking fact that the authors contention that "practically all the uplift occurred in the Pliocene and Pleistocene, the most recent epochs of geological time!" As examples he noted The Andes Mountains (cite ref. p. 127) and the Tibetan Plateau, which is considered to be one vast erosion surface that uplifted in the Pliocene-Pleistocene (pp. 128–129, 137–138). Oard summarizes; "Furthermore, they present an impressive table of mountains from all over the world that uplifted during this time frame (pp. 304–306)." With this impressive array of testimony from a variety of experts, we end our discussions relative to Geology, moving on to explain the glaciers and finally; the silent testimony of the Mammoths and their companions, lost. [ii] Duller, R.A., Whittaker, A.C., Swinehart, J.B., Armitage, J.J., Sinclair, H.D., Bair, A. and Allen, P.A., Abrupt landscape change post–6 Ma on the central Great Plains, USA, Geology 40(10):871–874, 2012. [iv] Knapp, C.C., Knapp, J.H. and Connor, J.A., Crustal-scale structure of the South Caspian Basin revealed by deep seismic reflection profiling, Marine and Petroleum Geology 21:1073–1081, 2004. [v] Artyushkov, E.V., Formation of the superdeep South Caspian basin: subsidence driven by phase change in continental crust, Russian Geology and Geophysics 48:1002–1014, 2007Oard, M.J., The geological column is a general Flood order with many exceptions; in: Reed, J.K. and Oard, M.J. (Eds. ), The Geological Column: Perspectives within Diluvial Geology, Creation Research Society Books, Chino Valley, AZ, pp. 99–121, 2006. [vi] Nadirov, R.S., Bagirov, E., Tagiyev, M. and Lerche, I., Flexural plate subsidence, sedimentation rates, and structural development of the super-deep South Caspian Basin, Marine and Petroleum Geology 14:383–400, 1997. [viii] Oard, M.J., The remarkable African planation surface, J. Creation 25(1): 111–122, 2011.Oard, M.J., The geological column is a general Flood order with many exceptions, J. Creation 24(2):78–82, 2010.